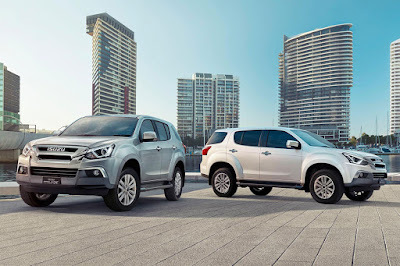 As a way of showing its appreciation to the millions of tireless overseas Filipino workers (OFWs), Isuzu Philippines Corporation (IPC) has launched its ”Isuzu Kababayan Promo” that would give generous cash discounts to OFWs who will purchase an Isuzu mu-X and/or an Isuzu D-MAX (except the Flexiqube variant) between the period of September 1, 2018 to December 31, 2018. The “Isuzu Kababayan Promo” will be honored at all Isuzu dealers nationwide. 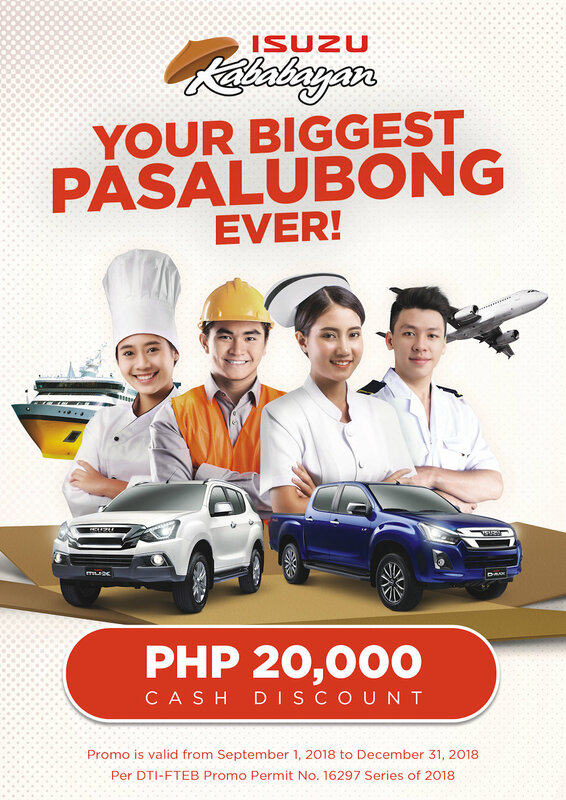 All qualified OFW applicants will be given a P 20,000 cash discount, and if the applicant is already an existing Isuzu owner, an additional P 10,000 cash discount will be given. These discounts will be given on top of other existing promos. All the OFW buyer has to do is to go to his or her nearest authorized Isuzu dealership, inform the attending Sales Executive that he or she is an OFW or an immediate family member is an OFW, present the pertinent supporting documents showing he or she is currently employed as an OFW (such as a photocopy of the Passport/POEA/Seaman’s Book), and one valid government ID, and a copy of the OR/CR of the buyer’s current Isuzu vehicle to avail of the additional P 10,000 discount. Upon purchase of the brand-new Isuzu mu-X or D-MAX, the buyer will then be asked to fill out a form to officially make him or her an Isuzu Kababayan Member. The purchased vehicle’s ownership can be named after the buyer or a member of his or her immediate family. The buyer can choose to convert the discounts into an outright cash discount, or avail themselves of Isuzu genuine accessories in the equivalent amounts. 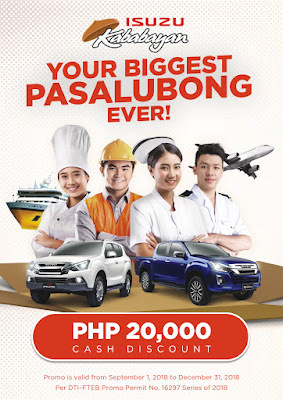 As much as the “Isuzu Kababayan Promo” is a show of support to the overseas Filipino, it is also IPC’s way of showing its gratitude to OFWs and their families who have given their trust to the Isuzu brand, which has built up a strong, enduring bond with Filipinos and their families over the decades.